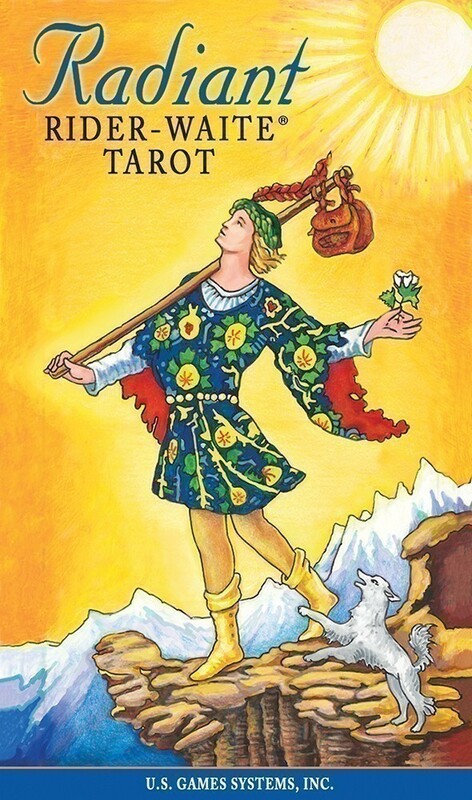 The new Radiant Rider-Waite Tarot is the latest offering in a long line of historically accurate decks from Stuart R. Kaplan based upon the illustrations of Pamela Colman Smith. For this very pretty new deck, the artist Virginijus Poshkus was selected to re-color the drawings. To describe the colouring of these cards as radiant is not an overstatement, as they are indeed shining and glowing, brilliant and luminous, and truly beaming with happiness. The cards have a clean, white border all around the images, with the numbers on the top in Roman numerals for the Major Arcana and spelled out in capital letters on the Minors. The titles and suits are in capital letters, in the same very pleasant typeface, also centered on the bottom of the cards. The cards themselves have a nice feel, as they are printed on good cardstock, and are plastic-coated and durable. They are easy to handle and shuffle, being sized at 2 3/4" by 4 3/4" overall. The packaging is in a standard size box, printed in complimentary hues of orange and blue to highlight the radiant color values of the cards within, and featuring the Fool and Magician cards from inside. The instructions are familiar, featuring an introduction by Stuart R. Kaplan, and follow the standard format used for all decks from U.S. Games in the Rider-Waite tradition, which is both helpful and convenient for every purchaser of these cards. I was very pleased to be able to add the new Radiant Rider-Waite to my personal collection. Virginijus Poshkus has done an excellent job of radiantly re-coloring the images, which will make them easy to read and use for beginners and the advanced student, and they should soon prove to be a favorite of collectors worldwide. Some people may feel that an "update" to a deck is unnecessary, that too many versions of the same thing amounts to overkill. 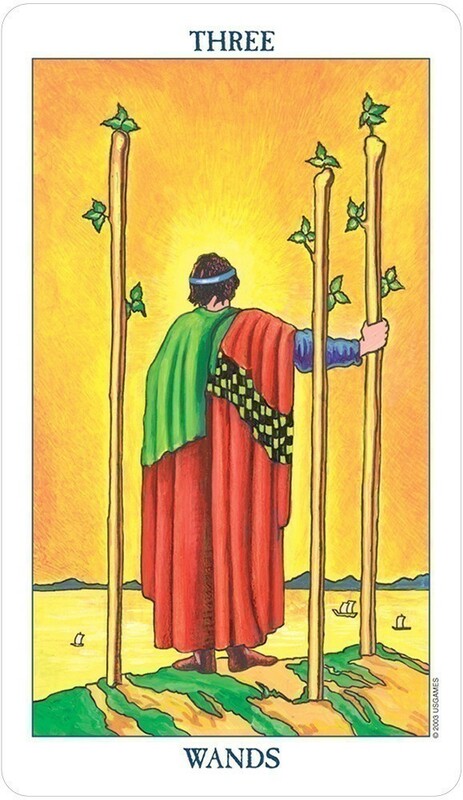 I often find that new versions do have something to offer, and that this is the case with the Radiant Rider-Waite Tarot. 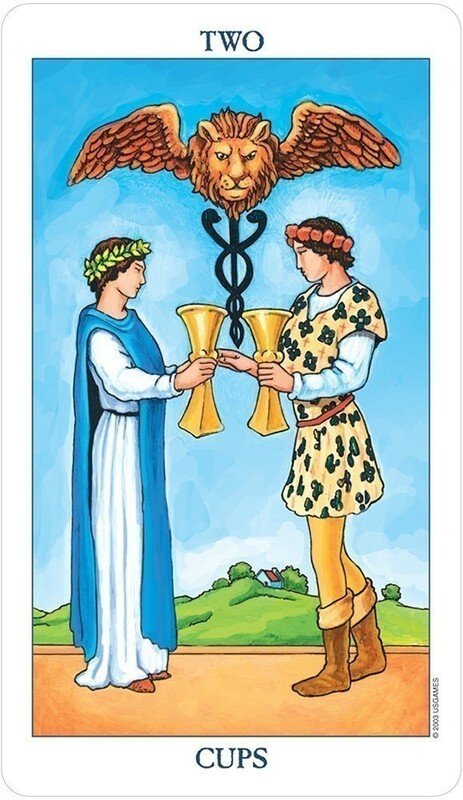 In the original version of this deck, there is an emphasis on the black outlining of the art, which to me takes away the ability to connect with the cards. The standard Rider-Waite was my first deck, and was almost immediately supplanted by the Morgan-Greer deck, a Rider-Waite clone that I could connect with much more easily. The Radiant Rider-Waite, had it been my first deck, would have been the deck that I stayed with for professional readings. I like the fact that the intense black lines have been discarded, and the crisp white border with the card number at the top and the title at the bottom. 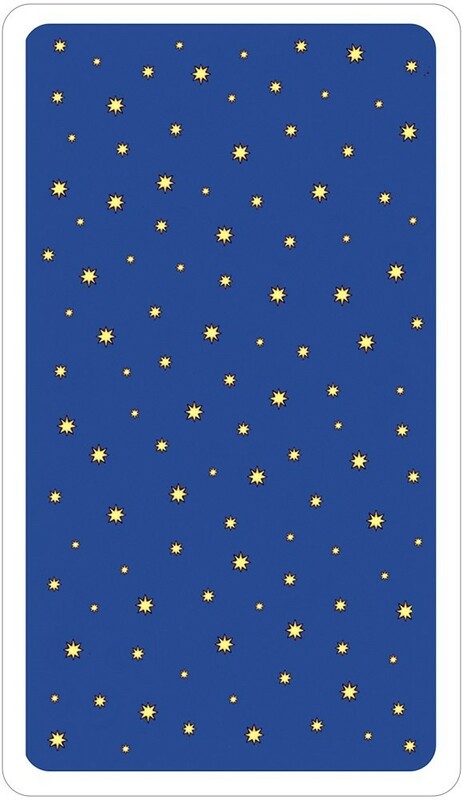 The back of the cards, carrying the image of a starry sky, is also far preferable to the diamond pattern of the standard Rider-Waite deck. The coloring is much more intense, with more of an orange overtone to the yellows. 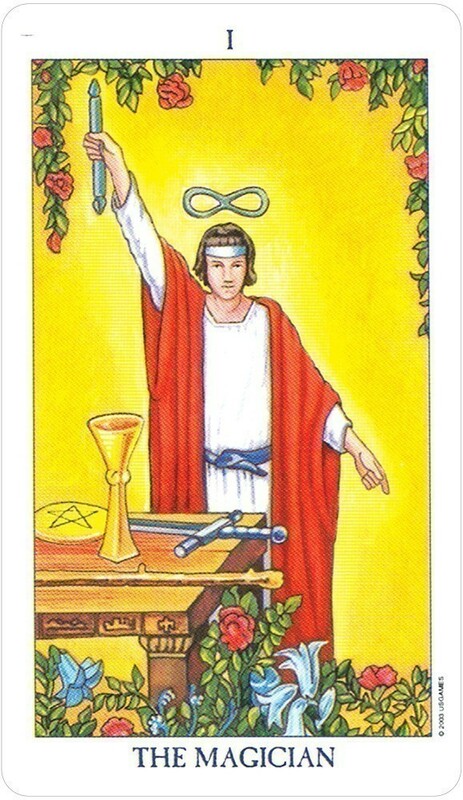 In some instances (the Fool, for example) there appears to be an aura of light around the figure(s) in the card. You really have to look for this, and I do not feel that it takes away from the ability to use this deck at all. The Empress ends up with more of an orange sky behind her, but the plant life is distinctly green, rather than the yellowish tone carried by the standard deck. The deletion of the black lines does seem to have affected the facial expressions on the figures in the cards - bringing them out, making them more evident. The rather gray background of the Hermit becomes an intense blue, which I feel adds rather than detracts from the card. The same holds for the intensifying of the color for the veil behind the figure of Justice. The sun over the mountain behind the figure of Temperance now holds the image of triple crown, which does seem to belong there. The Moon is another card that distinctly benefits from the increased intensity of the coloring of the sky. 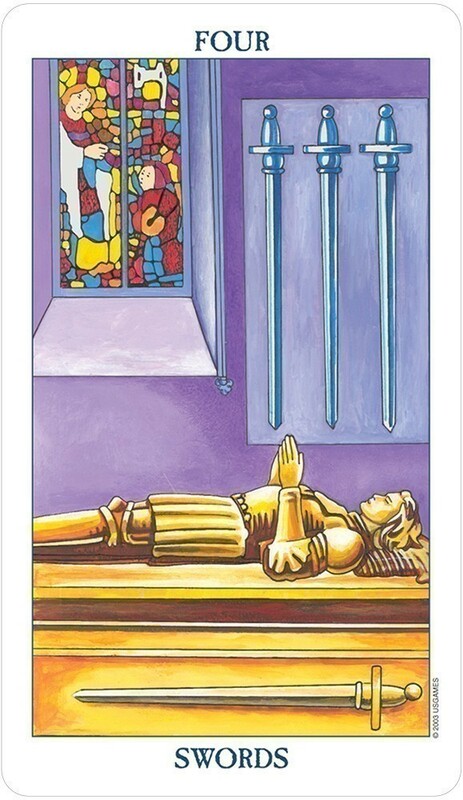 The stained glass window behind the figure in the Four of Swords becomes much more of a point of focus, and the little salamander in front of the seated King of Wands has his fifteen seconds of fame. I find the Radiant Tarot to be a deck well worth adding to my collection, as well as one to offer as a choice of decks for my clients. 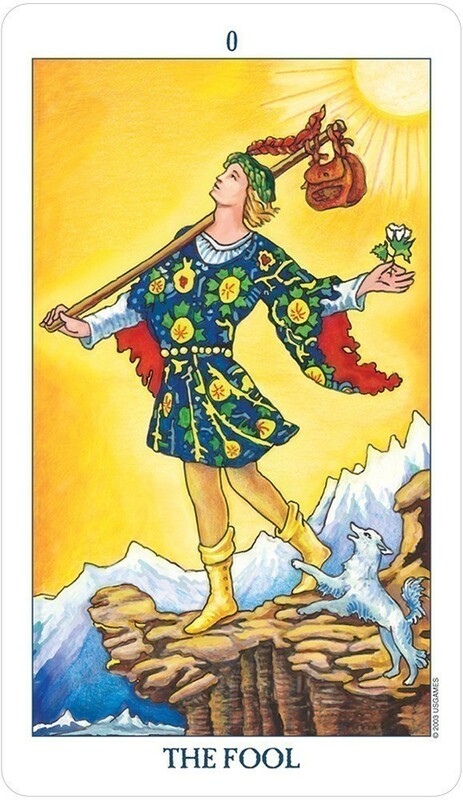 This deck has a close resemblance to another Rider-Waite clone which was also recolorized -- The Universal Waite recolorized by Mary Hanson-Roberts. The Radiant deck, however, features shades that are richer, deeper, and bolder than the softer pastel hues of the Universal Waite version. I would recommend the Radiant Rider Tarot to anyone who wants to stay with traditional Tarot, but who finds the colors of the traditional Rider-Waite to be too bland or boring for their personal taste. Many have disliked the original Rider-Waite deck as being boring or uninspiring, while others don't mind at all. But now there is another choice to help make tradition more fun, enjoyable, and inspiring. The Radiant Rider takes the familiar and comforting images of the traditional Rider cards and brings them to life with "radiance." The recolorization serves to illuminate Pamela Colman Smith's original work. If you're not in the mood for the traditional Rider-Waite, which may seem too "plain," or you find that you're also not in the mood for the softer colors of the Universal Waite deck . . . then the bolder colors in the Radiant version may be just what you're looking for. Just as with the Universal version of these traditional cards, this deck presents itself in a whole new light . . . and so, if you've been one to stay away from the traditional Rider-Waite deck due to the coloring used, the Radiant Rider is a good reason to take another look from a fresh perspective. is how it all started for me . 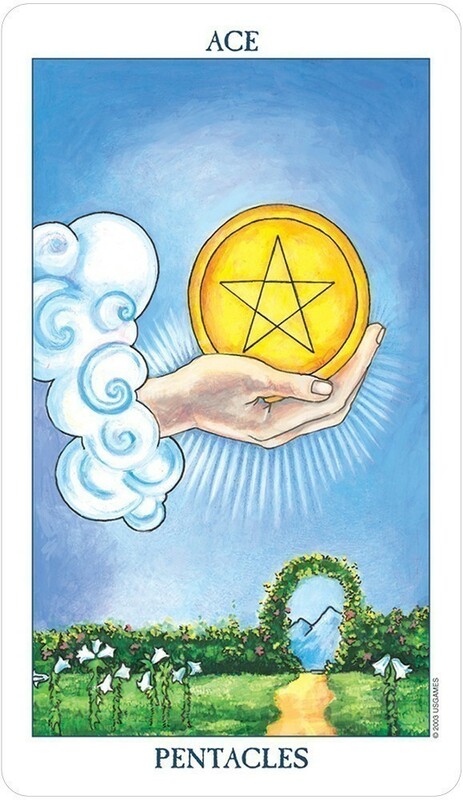 . . and with the Radiant deck now available, it's among my favorites and is favored by many of my clientele in the professional readings I do. It's just a bright, more colorful . . . and more illuminating experience to read with this traditional deck, which has been updated for modern times.